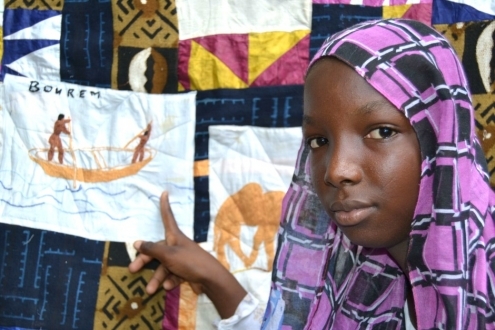 The quilts shown on these pages were born out of the devastating war that swept the north of Mali in 2012. 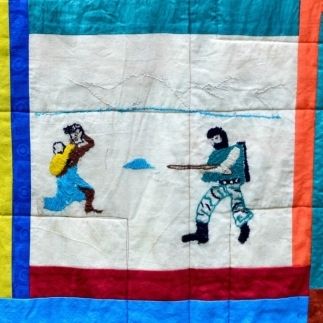 Tuareg rebels joined up with jihadist terrorists and seized the northern region, where they imposed a reign of terror on the inhabitants, especially women. 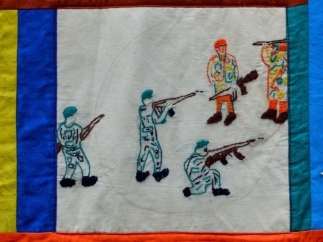 The rebellion was suppressed by a French armed intervention, but the region has remained unstable ever since. 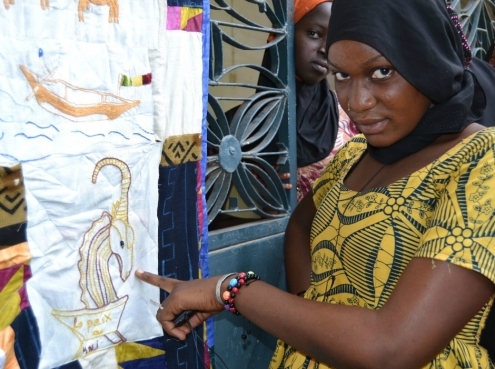 Hundreds of thousands of Malians fled from the north for the capital Bamako, or abroad. 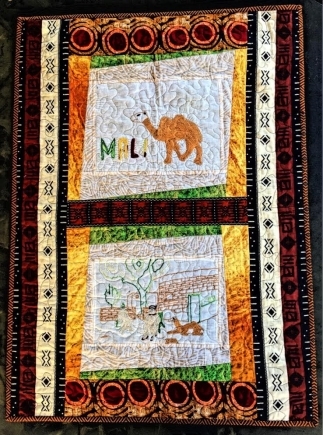 They included the artists who made the squares for these two spectacular quilts. 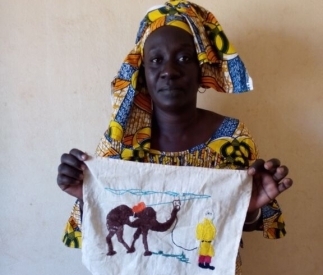 In 2013, AP developed a program with our Malian partner, Sini Sanuman, to support survivors of sexual violence from the war. 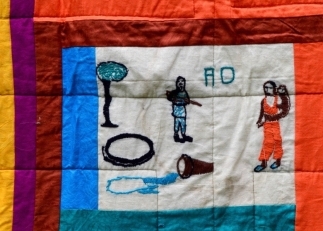 The program was modeled on the work of SOS Femmes en Danger in the Democratic Republic of the Congo. 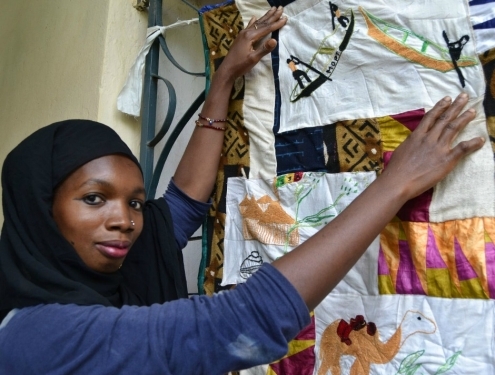 Sini Sanuman proposed to open two centers, in Bamako and Bourem, where survivors could spend up to three months relaxing in the company of other women and learning new skills. 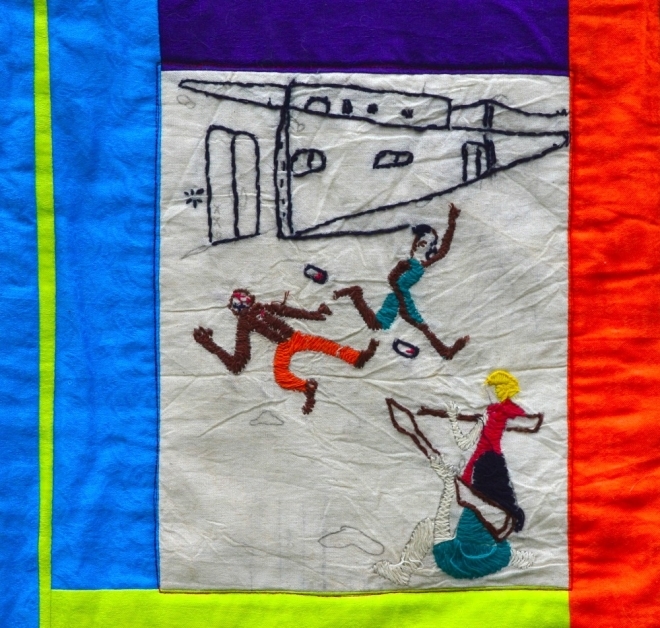 The proposal was submitted to Zivik, in Berlin, which funded our work with SOSFED in the DRC, and the two centers opened in June 2014. 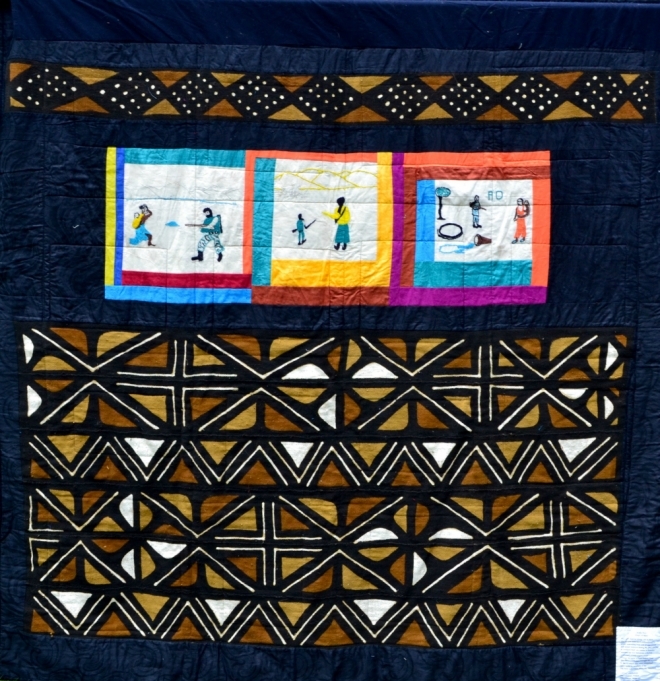 Our thanks to the Zivik team, which has helped to jump-start advocacy quilting by funding the Congo and Mali quilting projects. 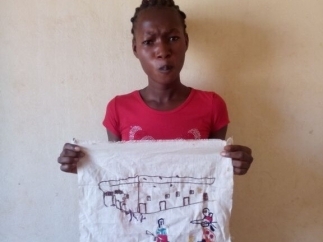 Over the next six months, 60 survivors received extensive training in embroidery, clothes-making and soap-making. 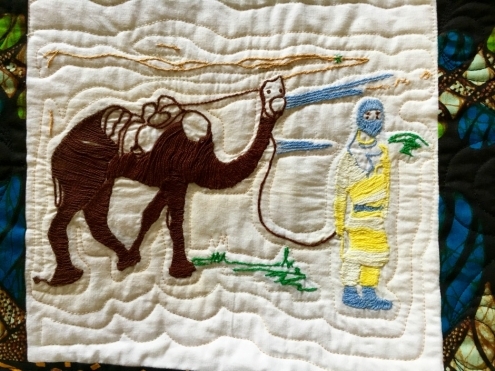 The two trainers who taught embroidery took a very different approach. 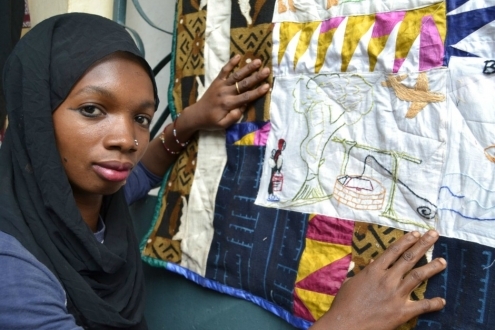 Oumou Toure, in Bamako, worked with bright cloth and urged the women to experiment. 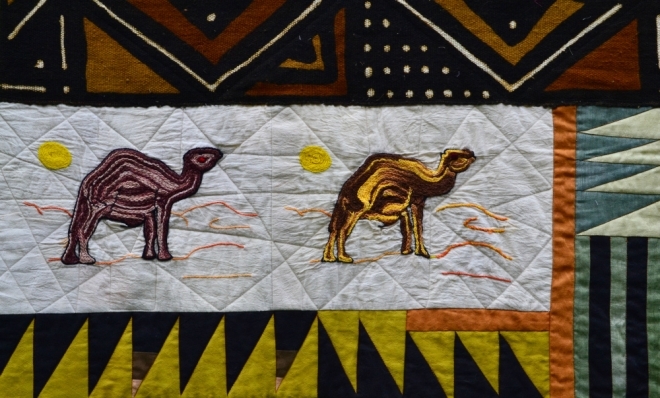 They produced exuberant patterns, but without a theme. 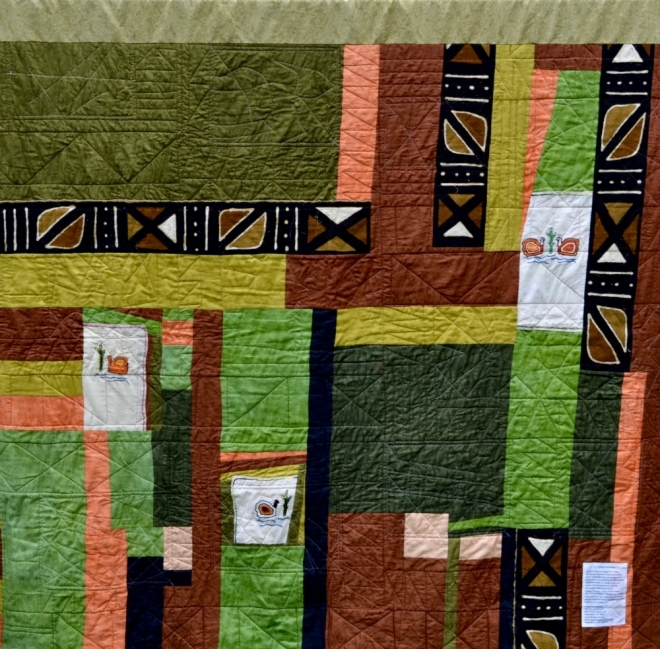 Also, the quality was very uneven. 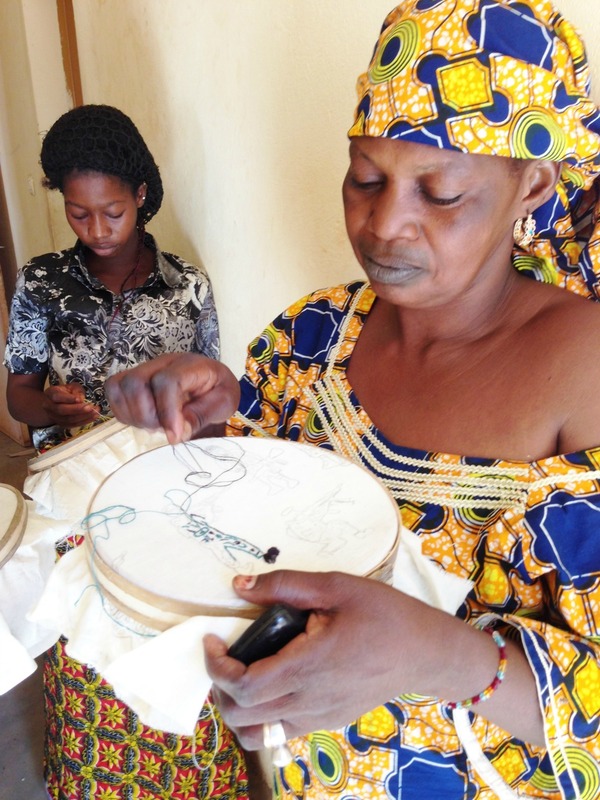 In contrast, Mariam Sidda Maiga, in Bourem, (left) began with the basics of sewing learned from her own mother. 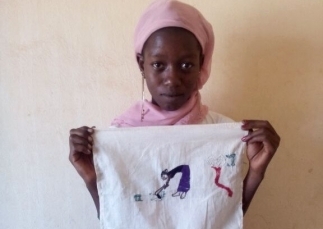 Her pupils progressed more slowly but acquired deep skills, and it shows in the quality of their sewing. 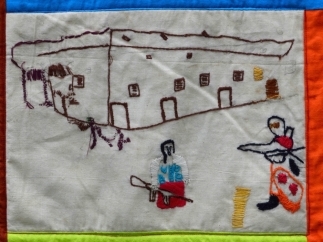 By September, the trainers and their pupils in both centers were struggling to find a way to tell a story through embroidery. 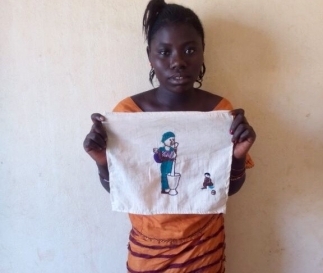 AP director Iain Guest visited in September for an evaluation and worked with Giorgia and the Sini Sanuman staff to come up with a solution. 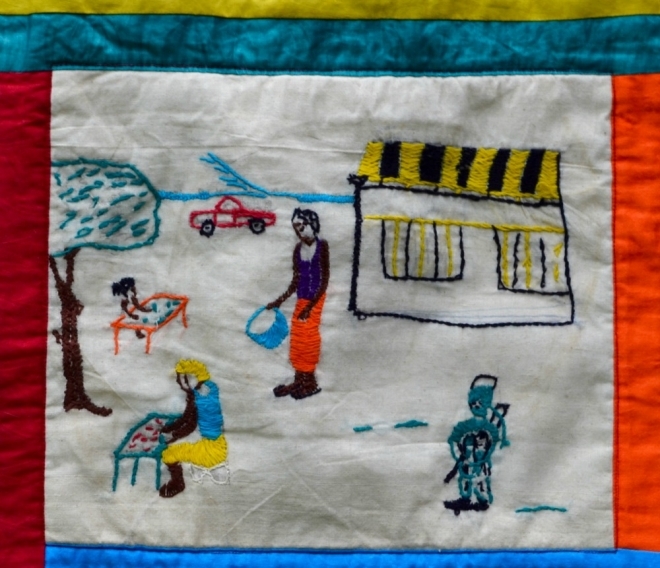 They visited the market and purchased new cloth and thread. 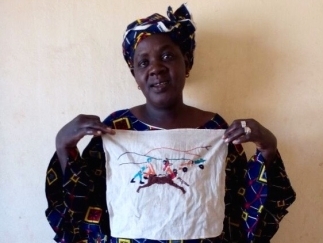 Giorgia and Mariam Seck, a leading Sini Sanuman outreach worker then explained the DRC approach to embroidery to the women at the Bamako center. 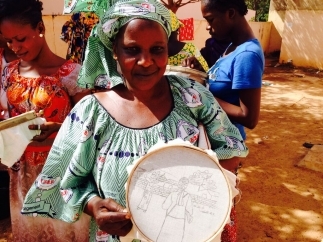 The next step was to hire two local artists to sit with the women and help them translate their ideas into pencil designs. 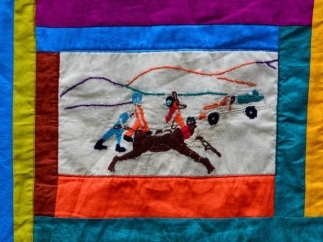 The survivors followed these designs as they embroidered their squares under the watchful eyes of their trainers. 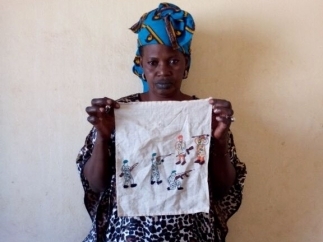 The Bamako women, who had fled in 2012, chose images that recalled the terror of the Tuareg attacks in 2012. 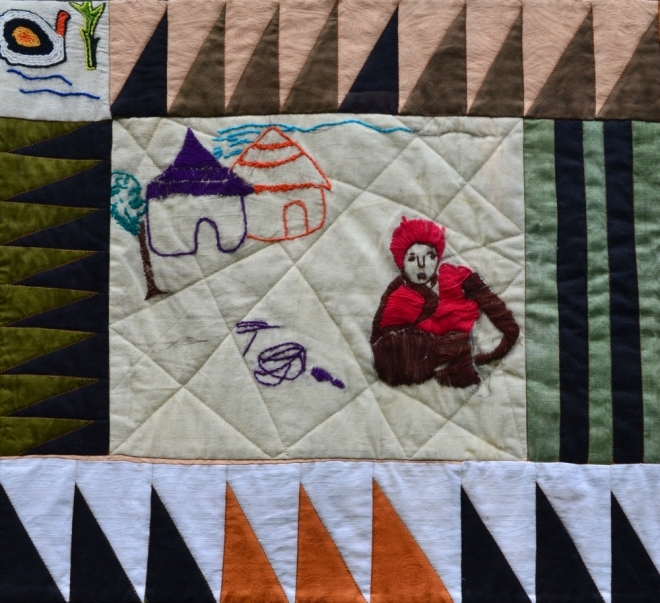 The women in Bourem, who had not fled even though they are currently living much closer to the war, chose more gentle themes of village life. 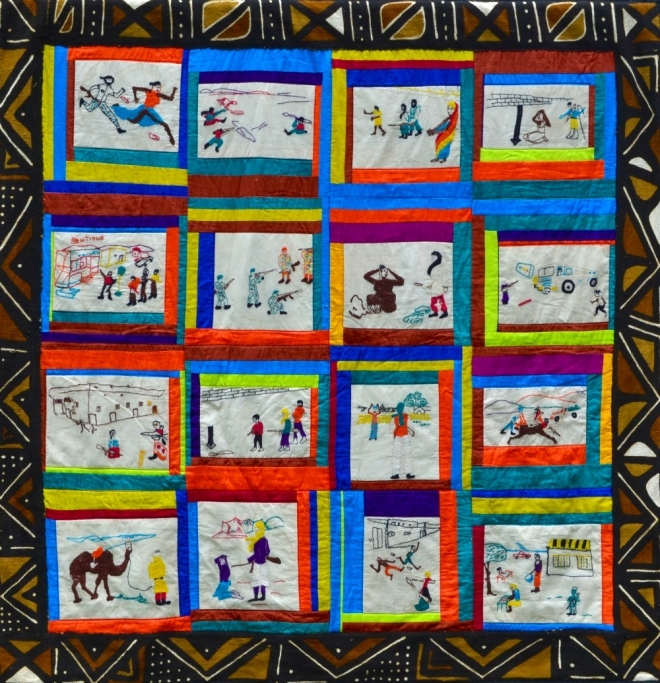 By the end of 2014, the 60 survivors had produced about 70 squares of widely differing quality. 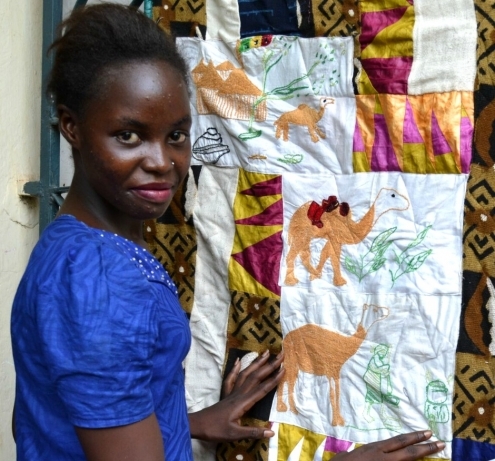 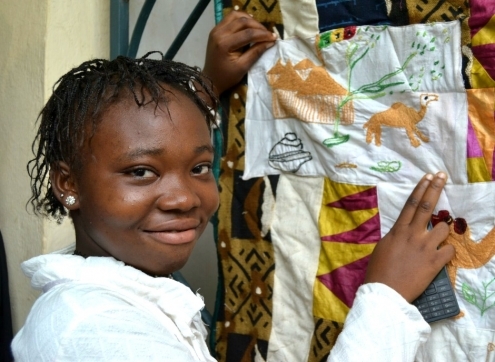 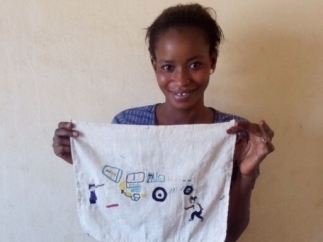 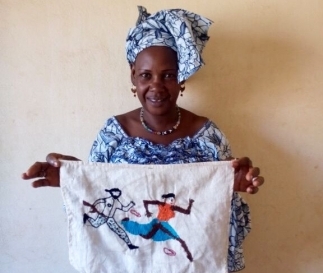 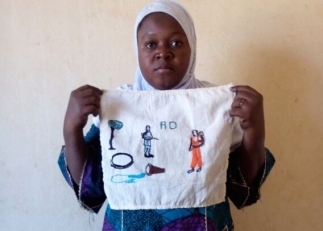 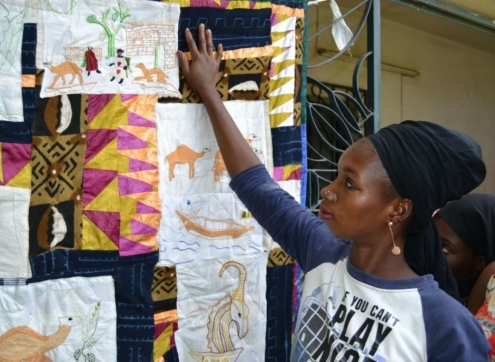 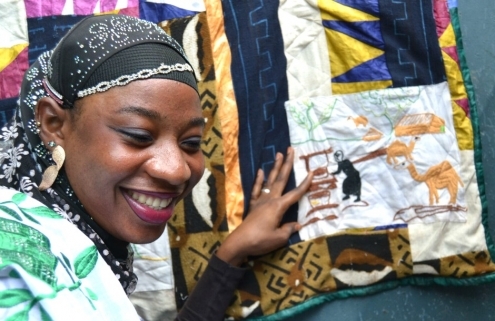 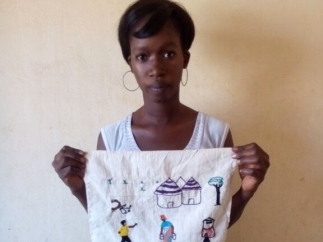 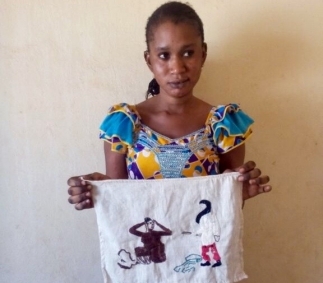 Giorgia – whose dedication and good humor did much to sustain the project in Bamako – purchased Malian mud cloth to serve as quilt backing, and returned to the US with the squares and cloth. 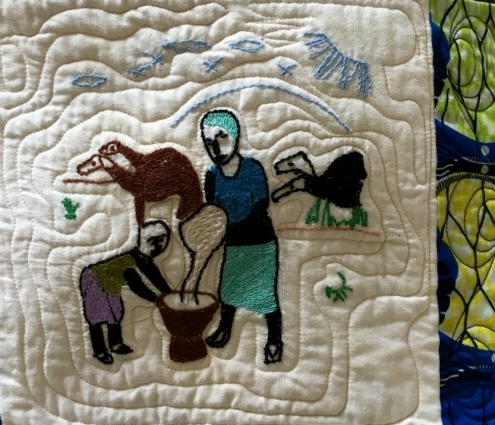 Together, Iain and Giorgia then handed the package over to the PM Fiber Arts Guild, to be assembled into quilts. 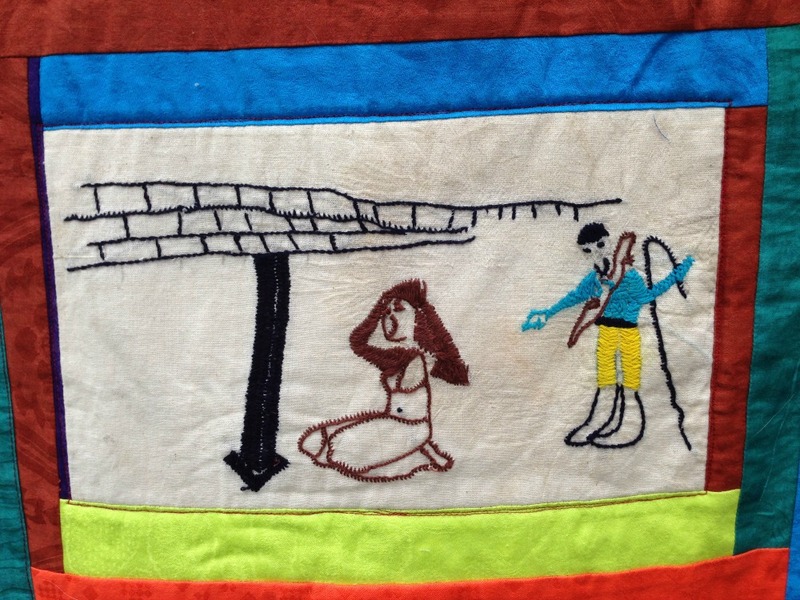 The finished product: This square shows a woman being flogged by a Jihadist in 2012. 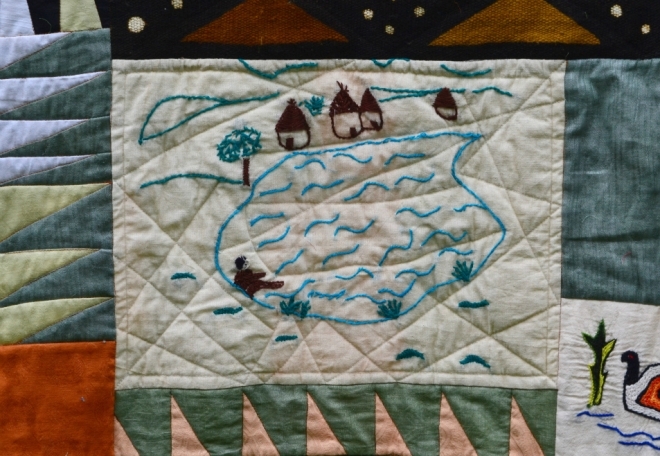 The quilters took on the entire range of tasks – designing, sewing, learning, paying for fabric and batting, and publicity. 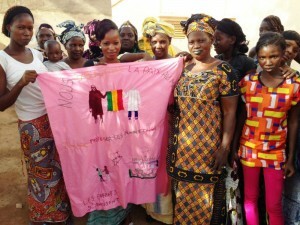 They were also able to benefit from a generous donation of Malian cloth from Yara African Fabrics. 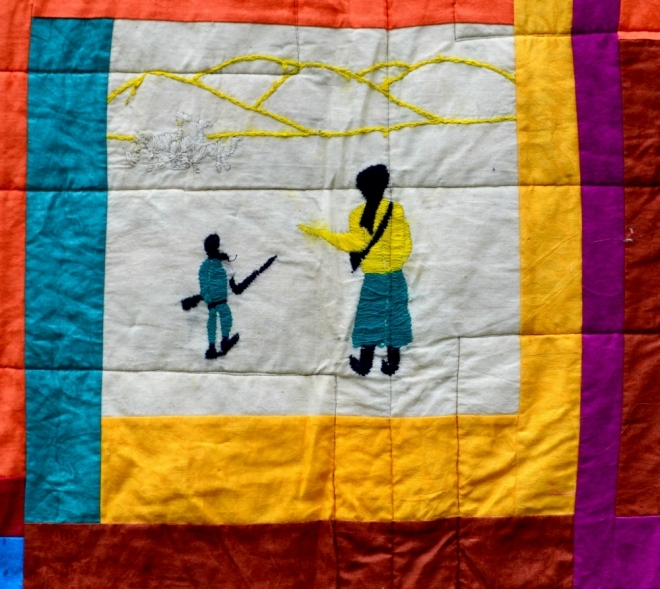 They divided the quilts into images of violence and images of serenity (mainly scenes of village life). 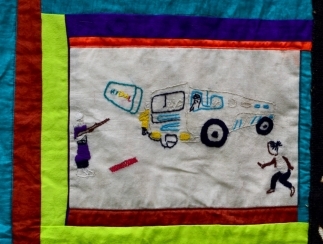 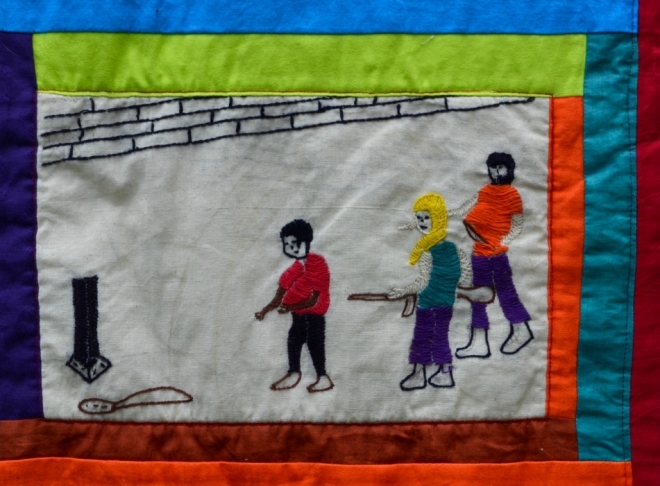 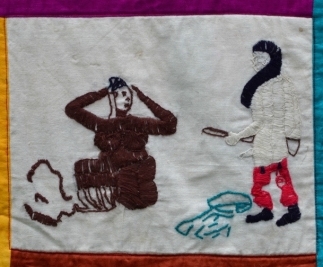 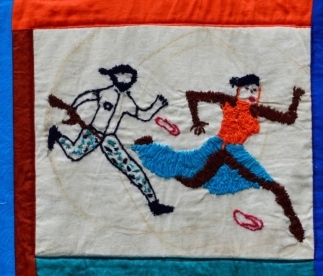 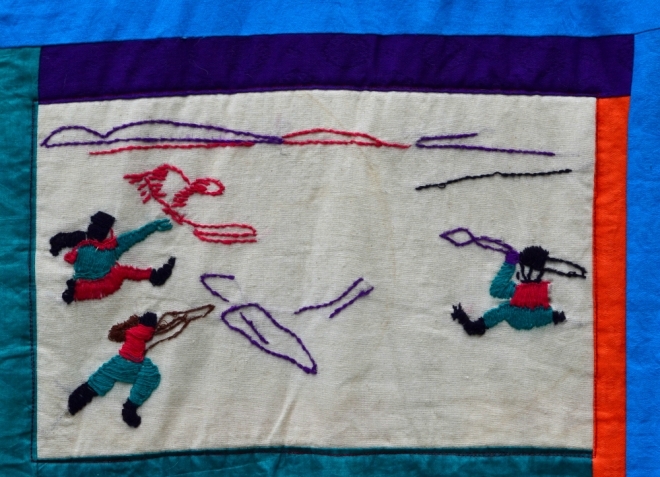 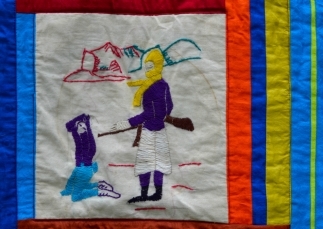 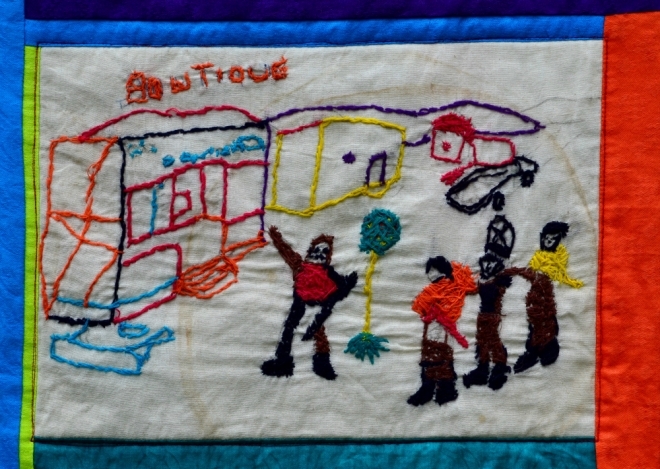 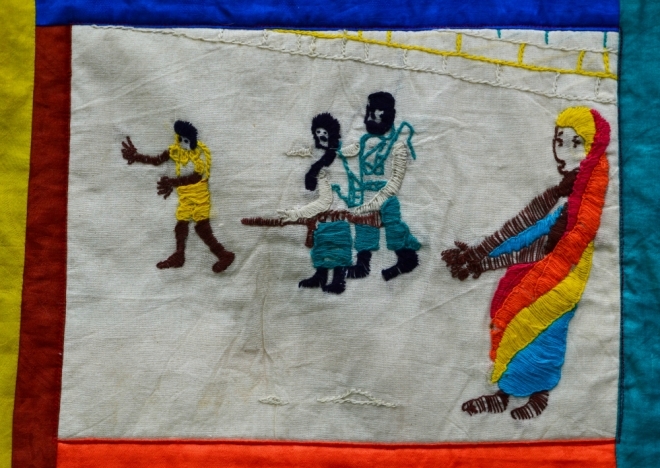 Many of the images from the war quilt are explicit and show women being flogged and attacked (photo). 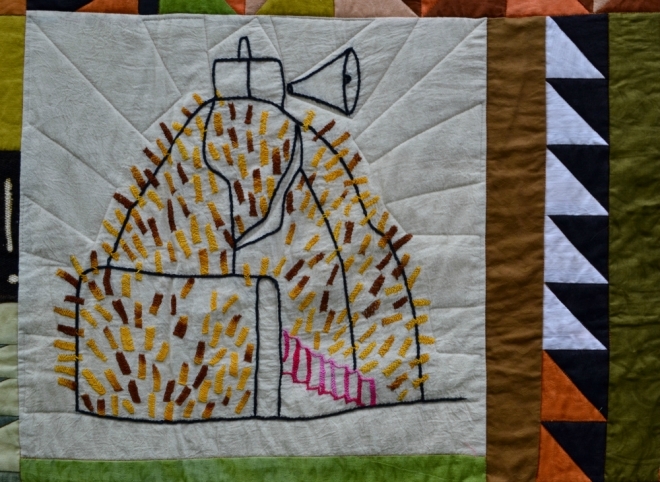 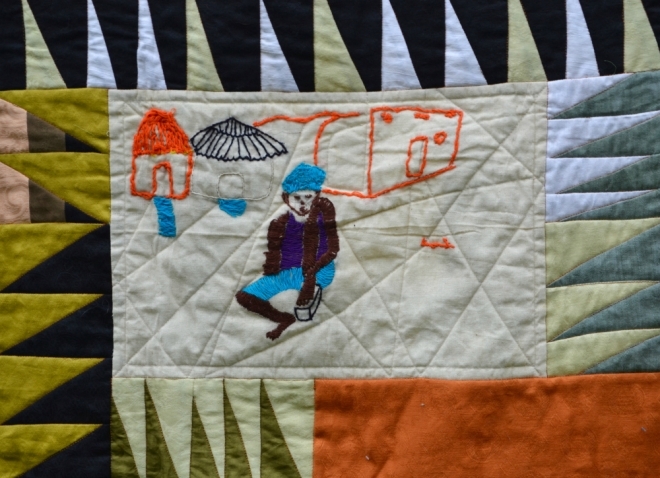 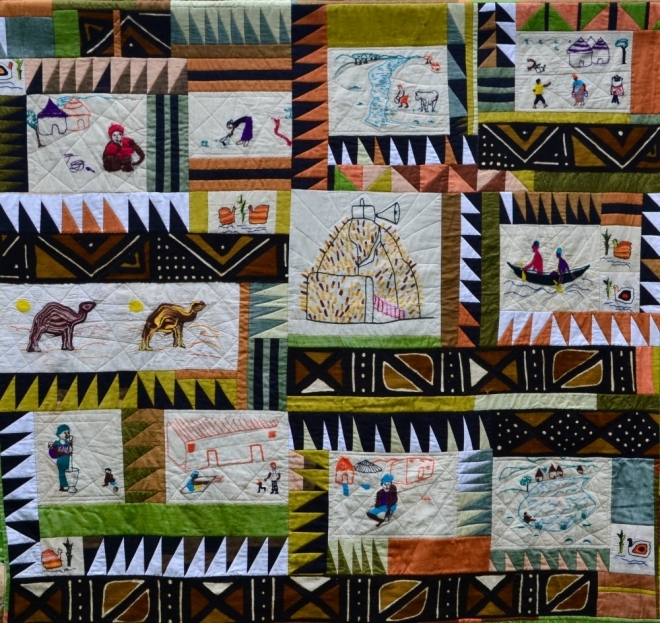 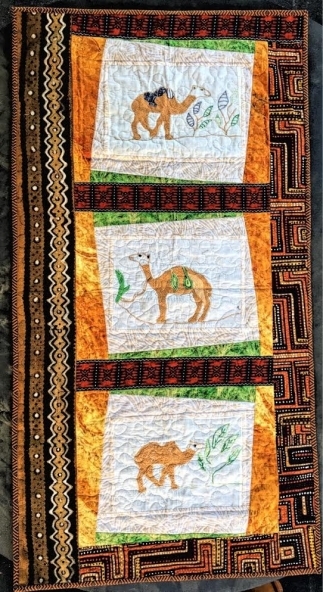 The second quilt, in contrast, carries gentle images of canoes, camels and village life. 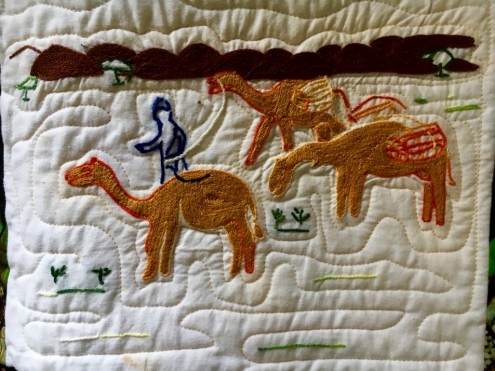 The quilters took turns working on the quilts and then convened at their regular meetings in Bethesda to review progress. 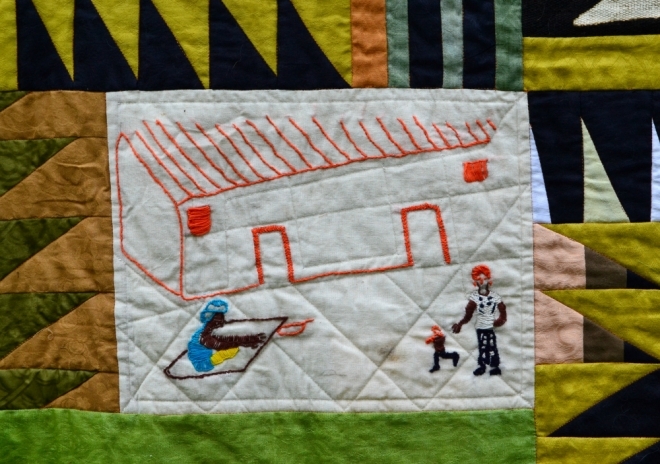 The two quilts were delivered to AP in April and exhibited for the first time at the Long Beach Island Foundation in New Jersey (July). 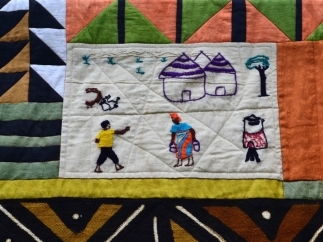 The following month, the two Mali quilts again featured in an exhibition at the Artists and Makers studio, in Rockville Maryland. 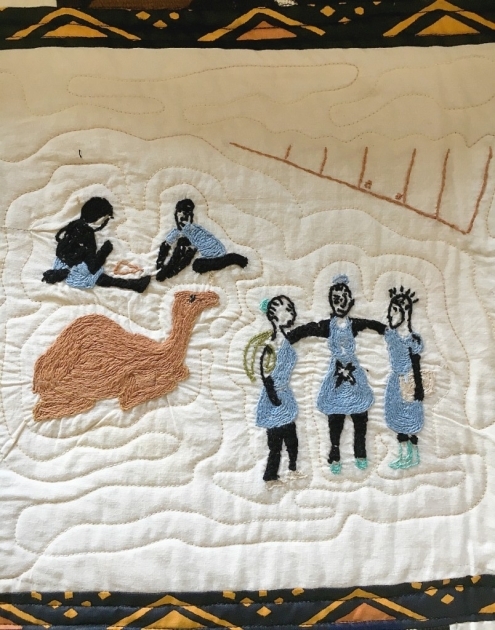 At the end of 2015, AP and Sini Sanuman began exploring ways to generate an income for the quilters. 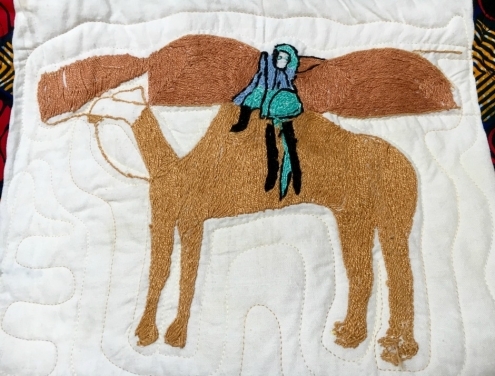 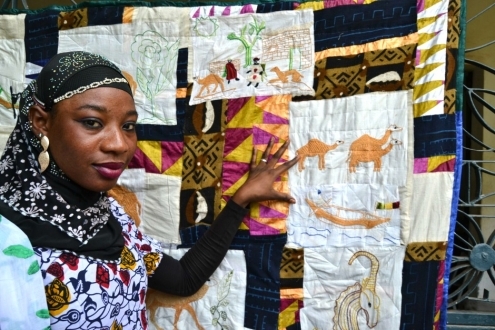 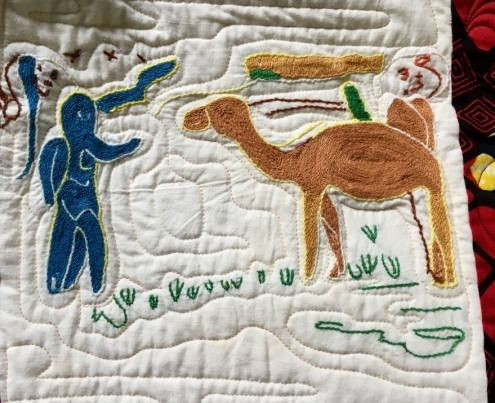 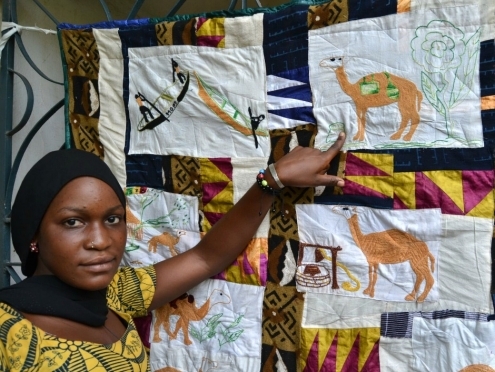 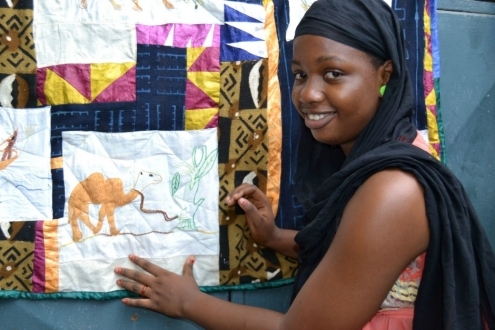 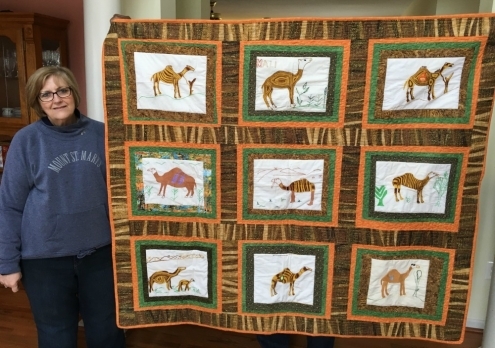 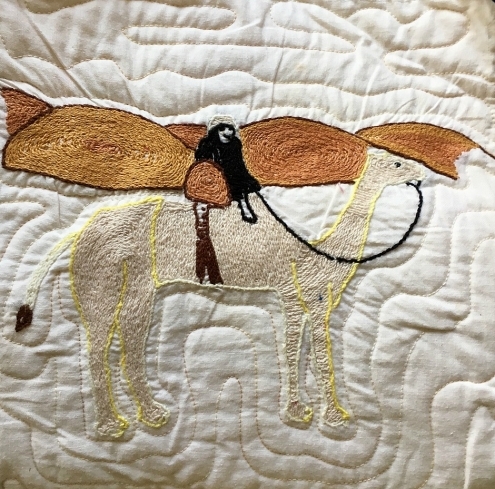 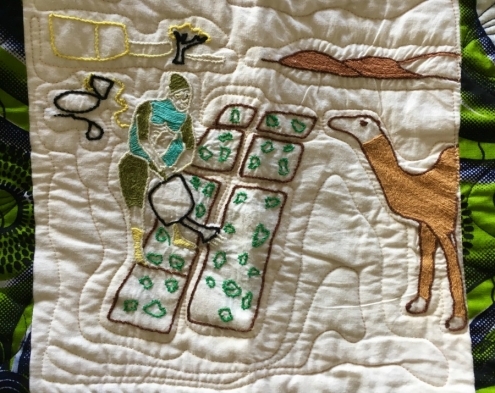 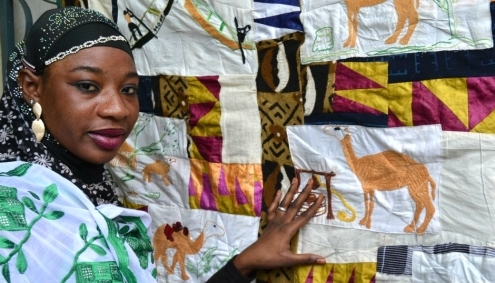 The final group of beneficiaries produced squares about camels that were brought back to the US and given to an experienced quilter, Merry May in new Jersey. 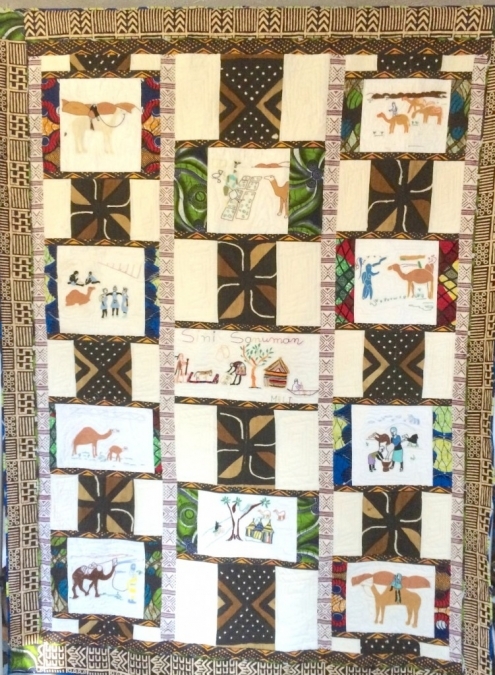 We hope to sell Merry’s quilt, expected in the spring of 2016, and develop a market. In addition, the Bamako center has started to make shea butter soap for sale. 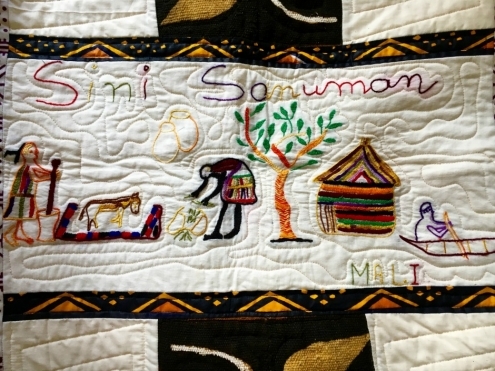 This is described more on the Sini Sanuman partner page. 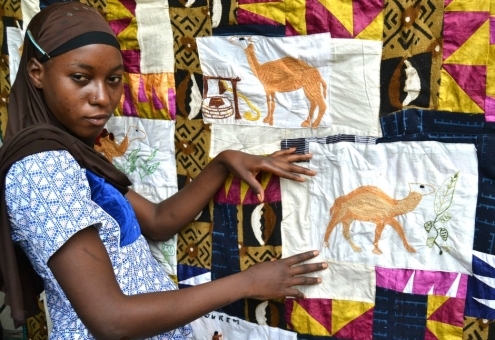 To watch shea oil being produced in the villages, click here. 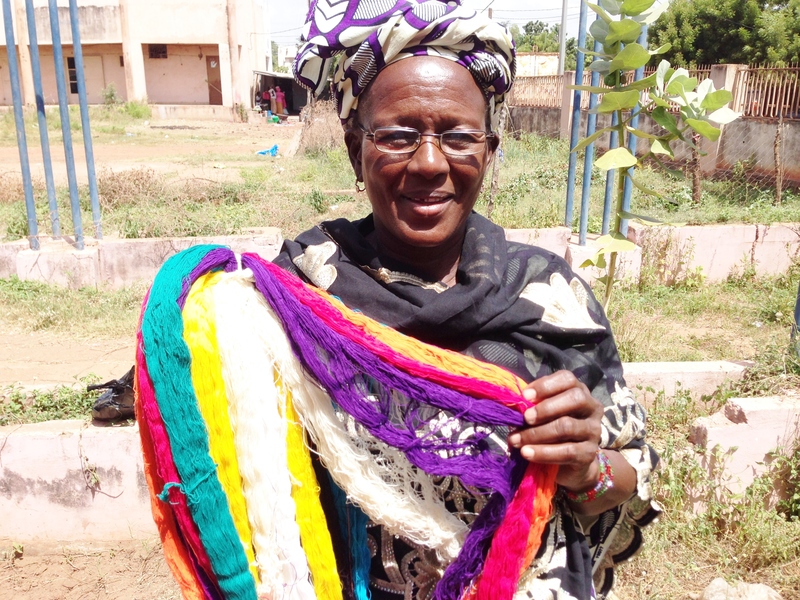 To see soap being made in the Bamako center, click here. 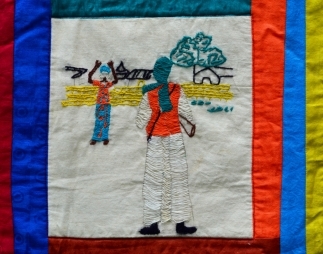 This panel depicts a woman fetching water and her village in the distance. 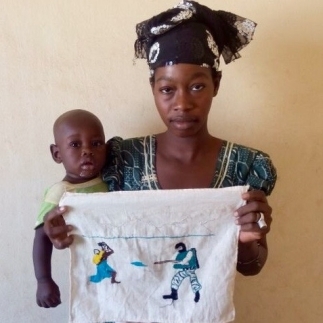 In Mali, collecting water is considered a woman’s duty. 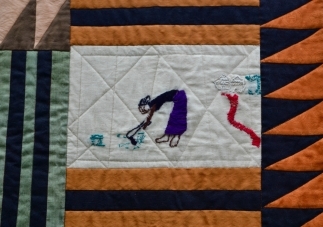 Since sources of water are often far from villages, some women must walk several miles a day just to get water. 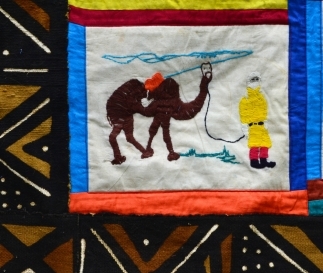 A typical Malian home, made of mud and straw. 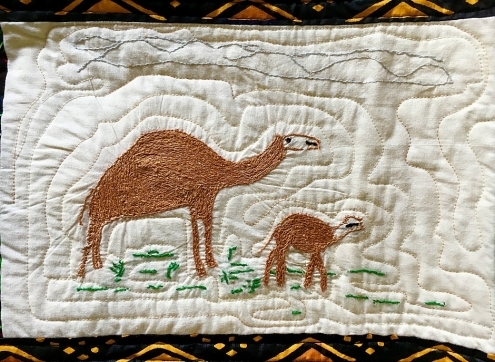 Dromedary camels walking through the desert. 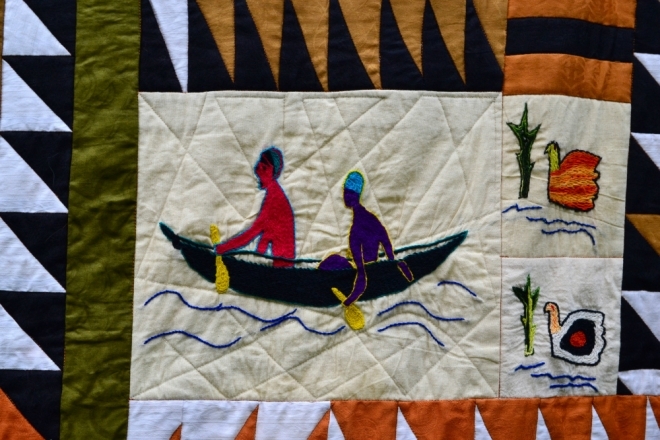 Two women on a pirogue, a traditional West African fishing boat. 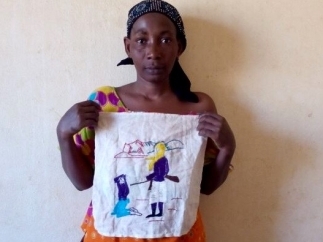 Disheartened woman, drawn away from her daily tasks. 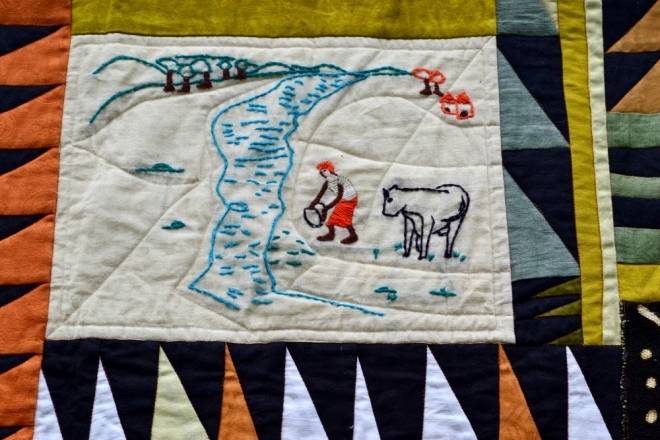 Woman fetching water with cattle. 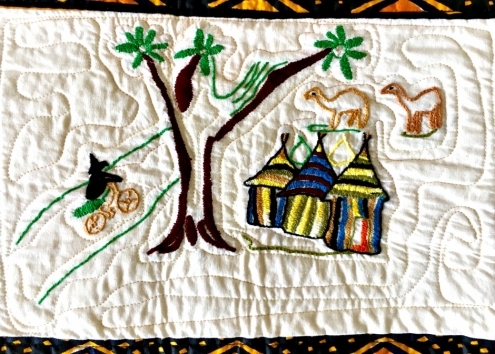 A family going about their daily lives. 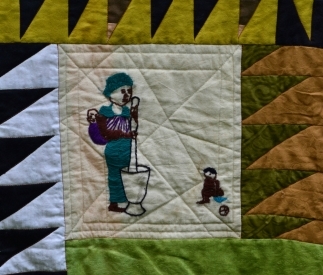 A man bathing in a river. 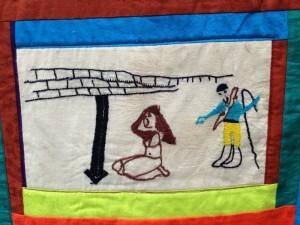 Woman (right) helpless as the military fires at a young boy.